This Pattern Memory game trains spatial recall including memory for visual patterns and location of objects. These brain skills can help you remember where you left your keys or parked your car, for example. Wait for the game to load, then click the "START" button on the game. To improve your spatial memory, play this game and other memory games like it for a few minutes each day. If you like this game, you might also enjoy the other free memory games on this site, such as Glassez, Trolley Dash, and Lightning Librarian. HOW TO PLAY. On each level of Pattern Memory, a visual pattern is displayed briefly then hidden. Quickly memorize the pattern of blocks. You have just a moment to do so. Then, using your memory of the pattern, click the blank squares to reveal the hidden pattern. 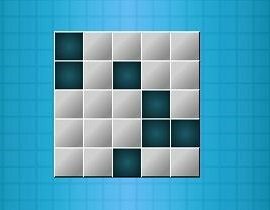 This pattern memory game includes 20 levels of increasingly complex block patterns. On successive levels, the size and complexity of the patterns you need to remember slowly increases. The more levels you are able to complete, the stronger your memory for patterns and locations. TIPS. There are several tricks you can use to get better at this game. First, pay attention to whether the corners are selected. This is easy to recall. Second, try to imagine shapes in the patters. For instance, does the pattern have the rough outline of a tree, a cross, or a dog? Visualizing a shape in a random pattern of blocks allows you to mentally chunk the random information into a single item in short-term memory. While the shape may not be a perfect representation of the object, the general outline provides you with a clue regarding which blocks are in the pattern. And every little clue helps! Third, on large grids, I find it sometimes easier to memorize the location of the blank squares. With very complex patterns, you might see as many blanks as selected squares. Finally, improvement also boils down to practice. Try playing the Pattern Memory game for 5 or 10 minutes several days in a row. If you take the game seriously and invest your full mental effort and concentration each time, you should find yourself reaching higher levels. ABOUT SPATIAL MEMORY. The hippocampus is the part of the brain thought to be most responsible for spatial learning and memory. Spatial recall helps you monitor changes in your environment and helps you orient yourself within it. Training this brain skill can improve your effectiveness as you interact with your surroundings on a daily basis.